2006/2007 Award Winning Hotel. The Ramada Inn and Suites New Orleans International Airport is conveniently located just off Interstate 310 on Airline Drive. 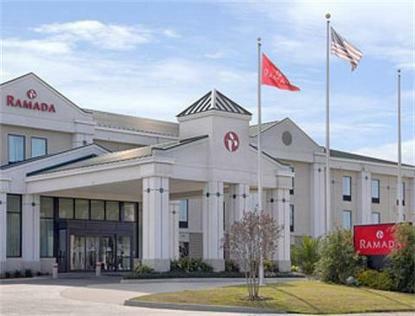 The Ramada New Orleans International Airport is located only 15 Miles from Downtown New Orleans. This hotel serves the Southern Louisiana Towns of Saint Rose, Destrahan, Butte, LaPlace, Norco, Taft, Kenner, Luling, Metairie, New Orleans, and Baton Rouge, Louisiana. The Ramada Inn and Suites New Orleans International Airport is conveniently located Near Swamp Tours and Plantation Homes. The French Quarter, IMAX Theatre, Bourbon Street, National D Day Museum, and Riverwalk are all a short drive from the hotel. The Treasure Chest Casino is only 5 miles from the hotel and several other casinos are with-in 15 miles of the hotel. The Ramada Inn &amp Suites has two restaurants on-site Voodoo Bar-B-Que, and Moccachino's in addition to these restaurants there are several other famous restaurants with-in a short drive. The Ramada Inn and Suites serves the Petro Chemical Industry and is located near Valero, Monsanto, Waterford 3, Shell Norco, DuPont, Motiva, Orion, and Dow Chemical. The hotel is a short drive from Lakeside Mall, and The Esplanade Mall also there are 8 major universities and 6 major medical centers with-in 15 miles of the hotel. The Ramada Inn and Suites offers Free High Speed Internet Access, Free Airport Shuttle, Business Center, Outdoor Pool, Exercise Facility, Cable TV with HBO.